On Monday, sophomores took part in team-building activities designed to prompt reflection on this year's 10th-grade theme: "Who am I with others?" 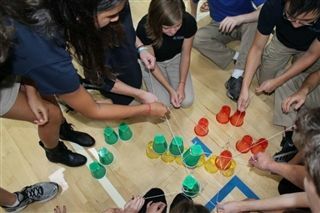 Students discovered a lot about themselves and their peers while rotating through eight different stations and completing tasks that included instructing a blindfolded partner through a cone maze, building cup towers using strings in place of hands, and working as a group to balance meter sticks and keep balls in the air. Successful completion of the activities required perseverance, grit, and communication - skills that will prove helpful as students embark on Planting a Seed, the signature project of sophomore year.